Let me just start by saying that canker sore is not the same as herpes. 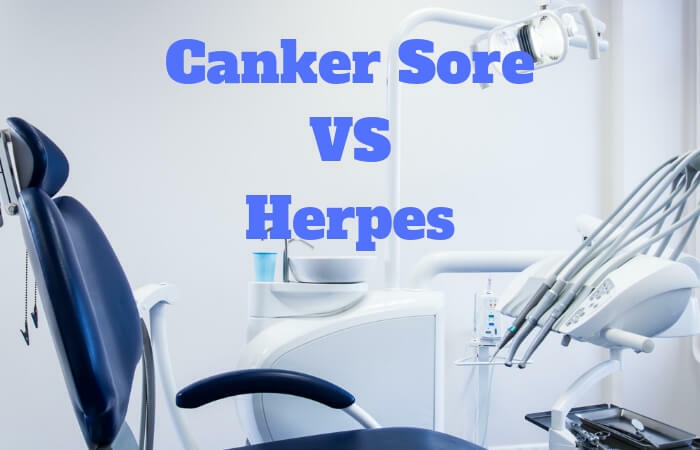 A lot of people refer to herpes lesions as “canker sores”. Even those with infected salivary glands and with other types of lesions are called the same. But, the right term for the blisters caused by herpes is “cold sores or herpetic sores”. These fluid-filled blisters are most often located under the nose and around the lips and chin. Canker sores are simply lesions because of irritation in your mouth due to injury, food intake and immune system problems. Herpes labialis (another term for oral herpes) is an infection of the gums, mouth, and lips caused by herpes simplex virus. Simple: These are lesions that are not more than ½ inch. Those in their 20s and below could experience canker sores up to 4 times a year. Eating acidic foods like citrus and apples could trigger this condition. Minor injury in the mouth and stress can also cause or worsen the lesions. It usually heals within 2 weeks. Complex: When the lesions are larger than ½ inch and they have irregular margins, they are the complex kind of canker sore. They are commonly seen in people with HIV/AIDS and those with problems in their immune system. Its healing period is longer than simple sores, and it could leave a scar. Appears in clusters. If you see small sores clustering into there or more-those are herpetic lesions and not simple sore. Canker sores are always inside the mouth. Herpes sores occur around the lips and outside the mouth. However, there is an exception. Sometimes, herpetic lesions can appear inside the mouth in tight clusters. You could see them at the roof of your mouth, hard palate and your gums. Cold (oral herpes) sores usually go away within two weeks or less. Your doctor may prescribe antiviral medications. You can also see your dentist for topical pain relievers to manage pain and to speed up the healing time. Those cold sores will heal completely. But, because the virus could reach and stay in the nerve roots at the location of blisters, they could reappear anytime. So, it is still important to talk to your physician to avoid reappearance of herpes blisters that could cause fluid-filled sores around the nose and eye area. Cold sores are highly contagious also. Yes! Call your dentist if you notice that the sores are unusually large, they are spreading and they don’t go away within three weeks. Having a dental checkup is advisable when the pain is becoming intolerable especially when you’re eating and drinking and you’re having high fever already because of the sores. They could tell you, whether it is a simple canker sore or if it is herpes. Oral herpes is not just an infection of the mouth and gums. It is a viral infection that affects the immune system. So, it is advisable to see a physician to manage the symptoms before they spread to other areas on your face. Early detection and treatment would also prevent the spread of viral infection to other people. But, you can see a dentist check if your cold sores would affect your teeth and gums, especially if you’re planning to go through certain dental procedures soon. Sodium Monofluorophosphate vs Sodium Fluoride - Is One Better Than the Other?